The SX88 has attracted huge attention in Europe. Now this show stopper has its sights set on a key market: The U.S. 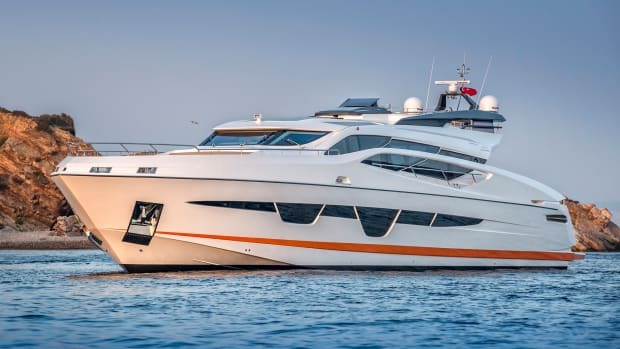 I look at the Cannes Yachting Festival as an industry-wide Charybdis, a maelstrom that catches boatbuilders, their boats, and a multinational slew of buyers in a swirling current of excitement and sophistication. 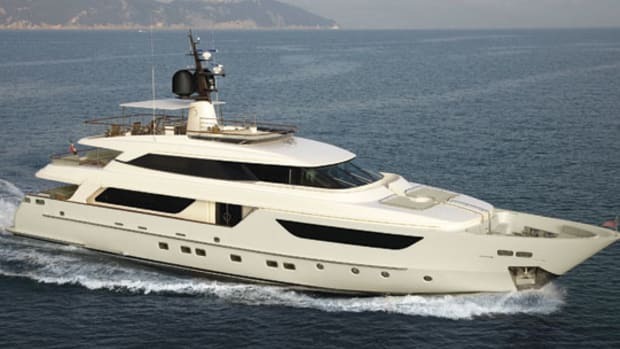 And last year, at the center of it all, was the Sanlorenzo SX88, becalmed on a dock in the Vieux Port. Turns out access to her was rather tightly controlled and the pier that led to her was a fortress. 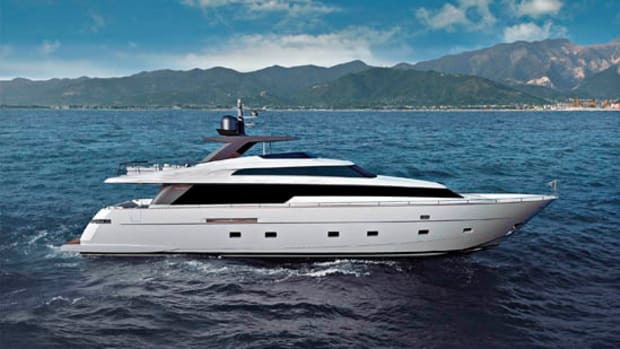 Her profile was nothing if not eye-catching in that prominent perch and one can see echoes of many of the design attributes that attract Sanlorenzo fans. But she is different, too. 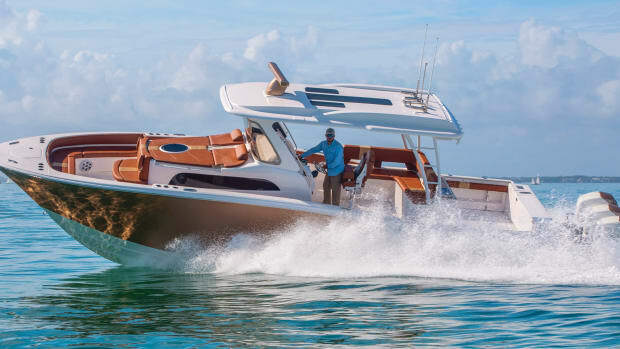 Sanlorenzo is adding to its traditional product lines, which comprise the planing series in sizes from 78 to 118 feet LOA, and a semidisplacement series from 92 to 126 feet. 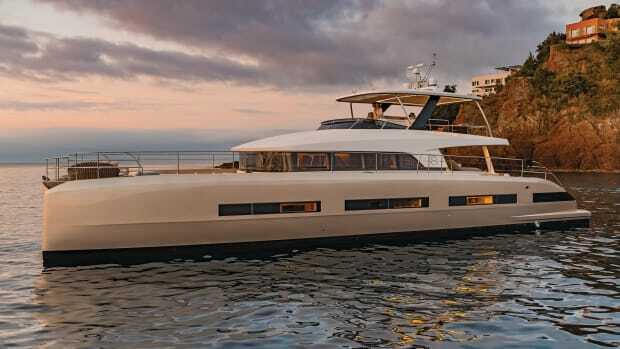 The superyacht range includes the steel hull and explorer lines from 133 feet with designs up to 209 feet. 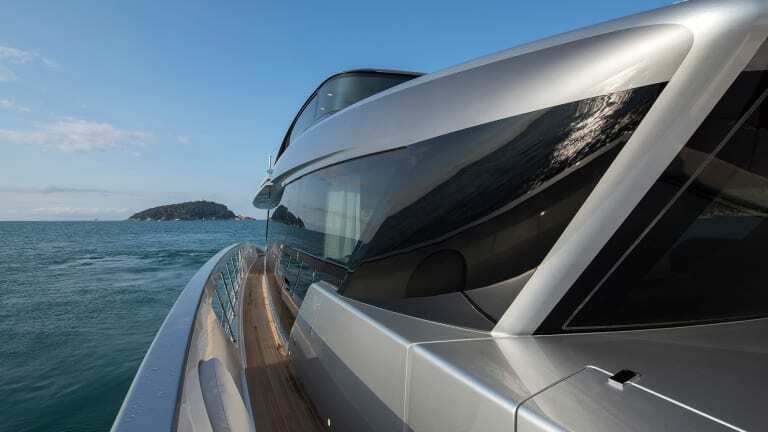 While the boat defies definition to some degree, Jousma explained the concept. “The SX88 is the first in what will be a new series,” he says. “Next will be the 72, which will come out at Cannes [in September] and then we’ll have something in a larger range as well. 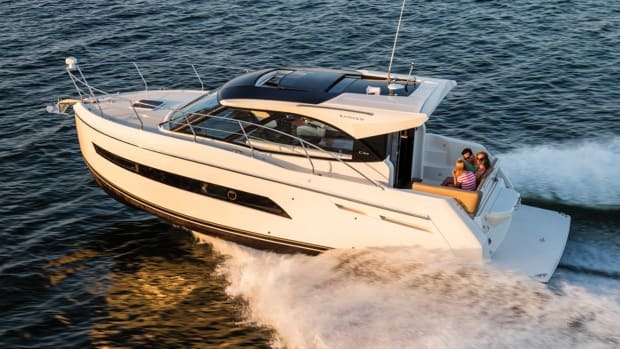 But we’re calling it fast displacement, while some are calling it a crossover.” The SX88 has a single helm station on the flybridge, with a fixed-glass windshield forward, though the large glass side windows power down to open the top deck. 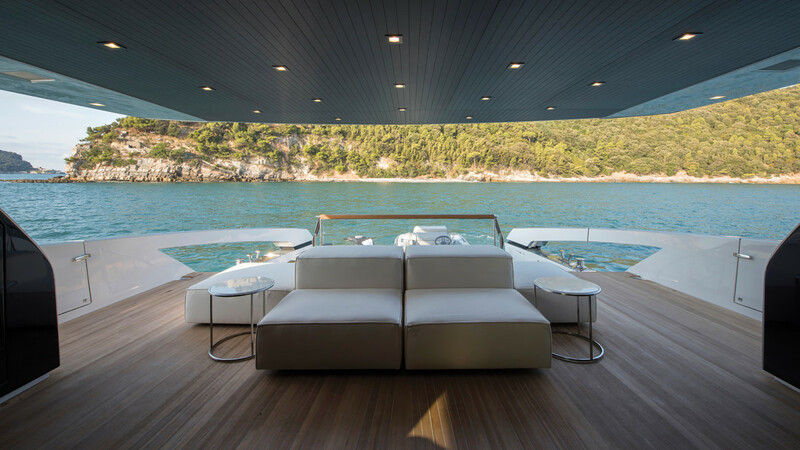 When I stepped inside, my entire conception of what a yacht can be—or more accurately, what one can have as an interior—shifted. 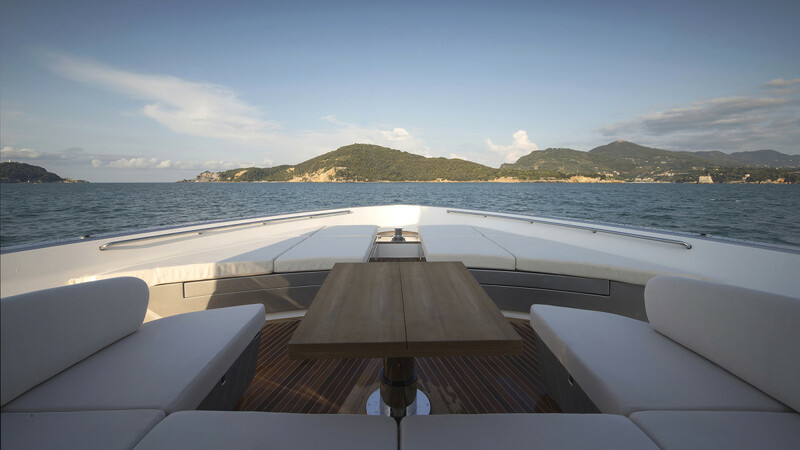 If the goal was to showcase the yard’s capabilities in creating something custom, it succeeded. The main deck is an open plan—it felt like a loft apartment—with huge side windows. Most fascinating: The raked, reverse-pilothouse windshield did not surround a command center for the captain. Instead it was another social space. 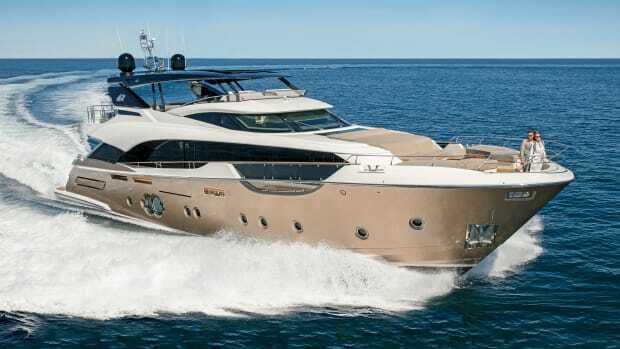 While a layout offering a main-deck master is available, neither Hull No. 1, built for Europe, or Hull No. 2, bound for the U.S., has it. Instead a four-stateroom layout welcomes owner and guests with an amidships master, two doubles, and a VIP forward. 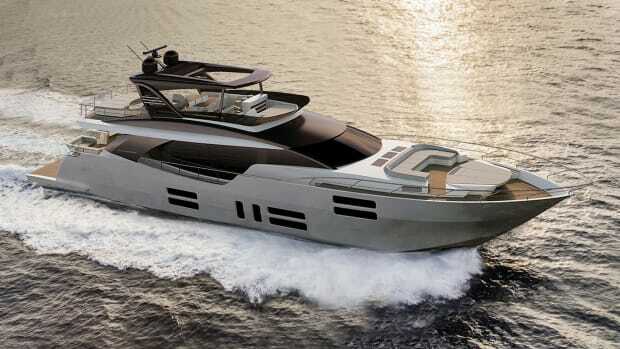 “I love that layout on Hull No. 1 to show as a prototype,” Jousma says. “Bringing a boat into the States [for Hull No. 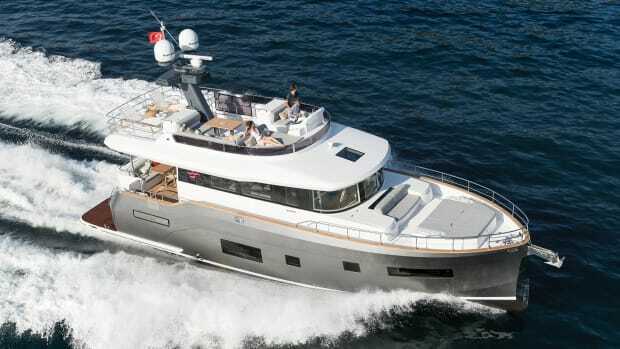 2] we did a four-cabin layout down belowand a more traditional main deck.” Jousma pointed out that, of 12 boats sold at presstime, seven layouts have been designed. After the first one with the loft feel the remaining six are equally divided—three have a main-deck master, and three have accommodations belowdecks. 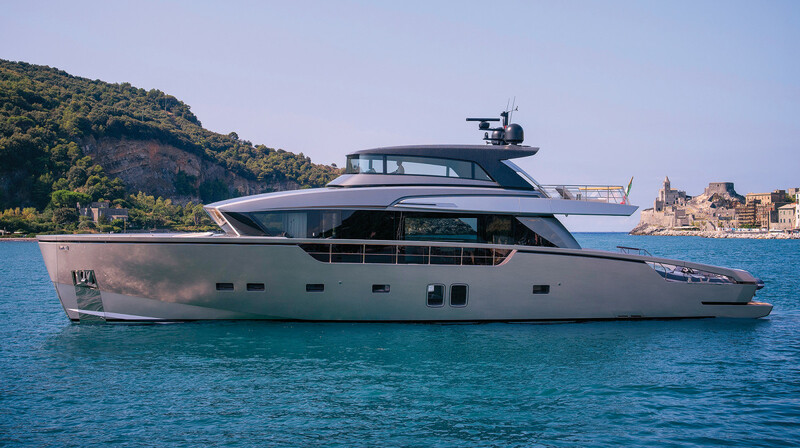 The first two hulls of the SX88 show that Sanlorenzo can think as far outside the box as boaters may want to—and build to suit.